Luggage allowances are shrinking and on many airlines, checking a bag comes at an additional cost. So a savvy traveler only packs what's most important. Travel Expert and BestTrip.TV Producer/ Host Lynn Elmhirst has packing down to a science. Here's what's in her bag. The smartest travelers and frequent fliers try to never check a bag. Not everyone can go that far. But everyone can pack smarter. It works both ways. Not only do you want to have everything you need, there's no worse feeling than coming home having lugged something around your whole trip and never used it. Packing Cubes. The first time you use packing cubes, you never travel without them again. They're indispensable to keep things organized and compartmentalized in your suitcase. No random clothes spilling out of your bag if you need to open it en route! And they save you precious holiday time: you can easily unpack at your destination, just opening up a cube and laying it in a dresser, then closing it up again and putting back in your suitcase when you move on. 3 Pairs of Shoes – 4 at the most. Believe me. No matter what your type of trip, anyone can travel successfully with 3 pairs of shoes – maximum 4, even though one of the best ways to handle tired feet from exploring all day is to CHANGE shoes so your feet still have support. Wear your comfortable (and heaviest) shoes on the plane. (This will keep the weight of your luggage down, too.) One pair of 'dressier' shoes for dinners/ evenings that go with everything. Another pair of day shoes to switch out sore feet makes 3. Maybe that 4th pair of shoes for the beach or your workout. Shoe bags. Put all your shoes in separate bags. Fabric shoe bags are kind to your leather shoe finish, but plastic bags will do. They keep street/beach/jungle dirt or moisture away from your clothes. 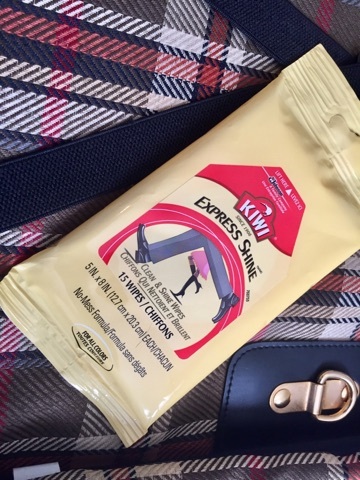 Shoe-Shine Wipes. Your shoes usually get dustier when you travel because you are walking around more. Shoe shine wipes (you can also get mini, enclosed, sponge/polish units) for any color of leather will keep you looking, well, polished for meetings or nice evenings out. A Large Wrap/ Scarf. Planes and trains and even hotels get chilly. Men and women both can need a little extra something even if there are blankets on the plane. A large, lightweight wool-type (not heavy knit) scarf/ wrap can keep you warm, and double as an evening wrap (for ladies). Black is almost always useful. A lightweight black cardigan sweater can do the same trick for men or women. A Small, Fold-up Umbrella. It can protect you from both rain and blistering sun. If you get one small enough, you won't even notice it in your bag. And it will save you the embarrassment of arriving somewhere dripping. Non-drowsy travel sickness medication. I never get travel sick but I carry it to help travel companions. Preventing people getting sick around you is as much a kindness to yourself as them. A Foldable Shopping/ Carry-all Bag. This is one of the most useful things you can carry with you at all times – not just when you are shopping. Carry it in your carry-on bag, then if you get to the airport and your carry-on bag ends up needing to be checked, you can pull out the foldable bag and still have something to hold essential carry on items. 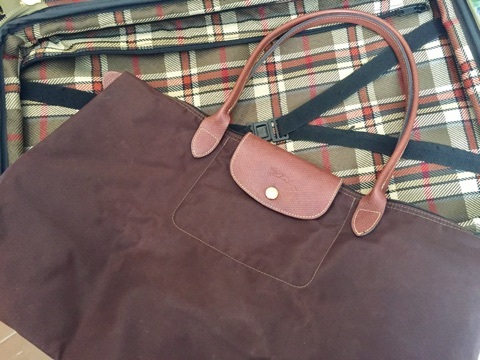 Splurge: on a Longchamp Pliage bag. It has classy leather handles and closure and very sturdy and stylish, water-resistant fabric in multiple colors. 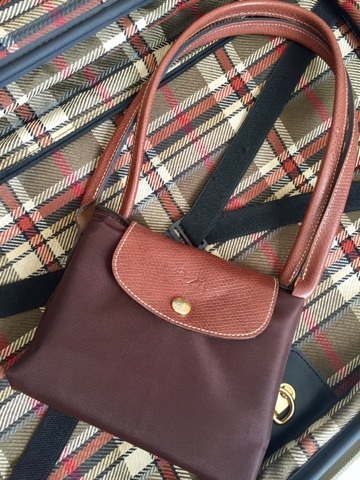 It can double as a purse or beach bag as needed but folds up to pack. Priceless. Plastic Bags. You can use plastic bags to store your wet or dirty clothes or muddy shoes. I know a savvy traveler who always has a roll of doggy-waste bags in the bottom of their suitcase. They are heroes to their travel companions in rainy climates. Multi-tool-plus-knife. Airline regulations still permit you to pack one in your checked luggage (but not carry-on) for emergencies. If you're like me, you love to check out local markets and food producers. So most of my travel 'emergencies' involve opening wine bottles and serving cheese. 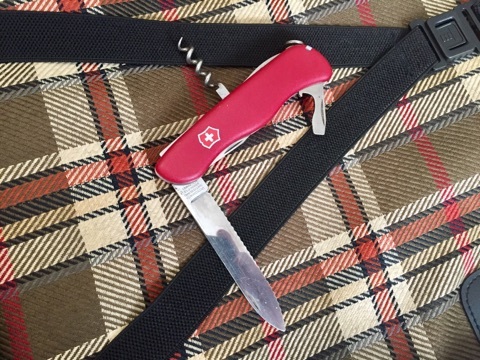 Splurge: on a real Swiss Army knife - it will last your whole life. It also makes a perfect gift for a traveler in your life. Pen. It is almost embarrassing to have to remind you. There's always someone in a line up or on a plane who needs to fill out a form and starts asking around for a pen. Don't be that guy. 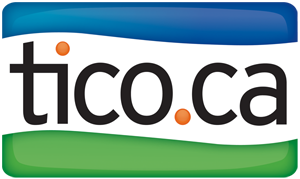 Hard copies of all your travel bookings, confirmation numbers, loyalty program numbers, travel insurance, emergency contacts and local addresses, including your hotels. The best digital solutions are only as good as the wifi that powers them. You don't want to be stuck unable to pull up a reservation or even the name of your hotel on your phone for the taxi driver if you can't connect to the local internet. Notepad – Same thing; never be completely reliant on digital technology when you are traveling. Names, phone numbers, names of restaurants… if your phone isn’t connected, your essential notes need to go somewhere. Flash Drive – Keep a back up soft copy of all those travel documents and reservations because paper documents can get lost, too, and your hotel will be able to let you plug into a computer (or your own laptop) to print them out again. Updated Travel Apps – Make sure you have up-to-date versions of your preferred booking apps, map apps, and language translation apps. Don't use expensive (and possibly slower) local wifi to update your apps. Smartphone / Device Battery Extender – Even if you are on your phone constantly now, chances are, when you travel you'll use it even more: more photos, more videos, map app running in the background… plus you may well find yourself away from a plug and running out of power. Carry a battery extender you can charge nightly in your hotel, or a portable solar charger. 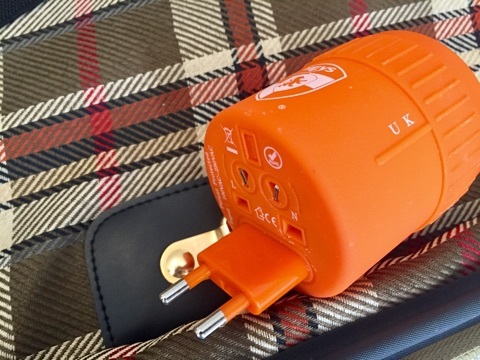 Converter - Abroad, an electricity adapter / converter for all your electronics will keep you powered up. Spend once, use forever: a universal unit that adapts electronics anywhere in the world. If you carry a lot of electronics, you might even want two. An extended-length smartphone charging cable. Use your phone as an alarm clock? Post to social media and reply to emails in bed? Not all hotels or cruise ships yet have bedside USB charging adapters. You may need to plug your phone in 10-12 feet from your bed. Emergency Cash. A nice number is $250 USD or Euro depending where you're going. Or a number that makes you comfortable to cover yourself if local bank machines are down and you can't get local currency, or a restaurant won't take credit cards, or… any number of little emergencies can come up when you're traveling that cash will solve. Having an emergency stash (hidden but on hand) can save the day. Contact information of your travel professional - If bad weather or other emergencies interfere with your travel plans, your travel agent/advisor is one of your best advocates to help get you home or your problems resolved smoothly. PLUS here's a big tip about what NOT to pack: Your most expensive watch, jewelry or sunglasses. First, many people lose things when they travel, leaving a trail of items in planes, hotels and taxis. Second, in some destinations, pricey accessories make you a target. That's not the sign of a smart traveler.